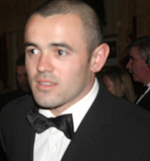 Stephen Carr decided to " hang up his boots " in December 2008 having failed to find a club following hsi release from Newcastle United. His position is right back. After being rejected by Arsenal as a fifteen year old, Carr had a trial at Tottenham Hotspur and was signed up by then manager Ossie Ardiles. He made his debut for the club on September 29, 1993 away to Ipswich Town in the 1993-94 Premier League season. However he had to wait until the 1996-97 season to establish himself as a regular first-team player, when he made 28 appearances that campaign. He picked up a League Cup medal with Spurs in 1999 after contributing to a 1-0 win over Leicester City in the final. The 1999-00 Premier League season was arguably his best ever as far as his performances are concerned. As well as scoring a fantastic 35-yard screamer against champions Manchester United, he was also named Babe of the Year. His reputation continued to grow throughout the 2000-01 Premier League season, and other clubs were beginning to show interest in signing him. However, in the summer of 2001, he began to have problems with his knee and required an operation which he underwent in September of that year. He did not make any appearances in the 2001-02 Premier League season and would also miss the World Cup 2002 finals. It wasn't until October 2003 that Carr was back in training and fully fit. As he returned to form, interest from other Premiership clubs started to resurface. Carr was linked with Manchester United, and a move to Newcastle United was on the cards. Carr signed for Newcastle United in August 2004 when then manager Bobby Robson signed him for a fee of £2million and a contract that would last four years. Soon after he signed Bobby Robson was sacked from his managerial post by chairman Freddy Shepherd. He was replaced by Graeme Souness, who like Robson, saw Carr as a first-team player. Carr's debut for the club came in a 2-2 draw against Middlesbrough on August 14, 2004. He played in 26 league games in the 2004-05 season, scoring once. His first goal for the club came from a 30 yard strike against Southampton. He helped Newcastle reach the quarter-finals of the UEFA Cup and the semi-final of the FA Cup. Newcastle finished 14th, which put pressure on Graeme Souness. In the 2005-06 season, he only managed to make 19 league appearances for the club as the persistent knee injury ruled him out for 2 months. The team finished 7th in the league under the new management of Glenn Roeder, after Souness was sacked in January. Carr has cemented his place as Newcastle's first choice right back, and he has made 87 appearances, none of which have been as a substitute. Many Newcastle United fans give Carr the blame for some costing defeats, particularly against Bolton Wanderers on October 15, 2006. Poor defending from the Irish wingback led to Bolton's two goals and allowed Bolton to win the game 2-1. Carr was one of the many injury victims at Newcastle during the 2006-07 season and was out with a fractured foot for a few months. He returned for the 2-2 draw against West Ham United on January 20, 2007. However in this game he found himself filling in at an unfamiliar left-back position after impressive displays from Nolberto Solano at right-back during Carr's absence, putting question marks over Carr's future at the club. The signing of Geremi from Chelsea F.C. could further place question marks over Carr's first team future at the club, with Geremi able to play at right-back. He has represented his country at Schoolboy, Youth, Under-18, Under-21 and full international levels. He missed out on the 2002 World Cup due to injury. He initially retired from the international scene after the team failed to qualify for the 2006 World Cup having played 39 times for his country. However he was convinced to continue playing international football by new Ireland manager Steve Staunton. Stephen Carr announced his retirement from International football in November 2007. Games in which Stephen Carr was a Substitute.